Why you Need to Stop Living Paycheck to Paycheck - and How - Women and Money Inc.
Are you one of the many people these days who are living paycheck to paycheck? What would happen if your paycheck was delayed by even one week? Would you be facing bounced payments, payday loans, and eating only what’s already in your pantry and fridge? 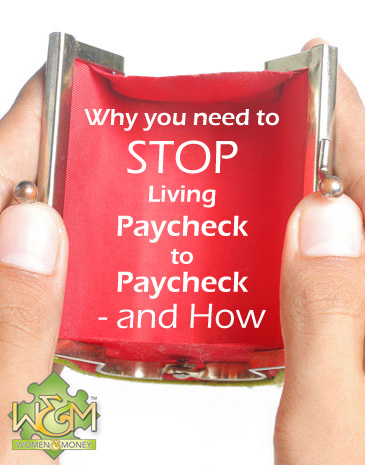 If so you are at risk, find out why and what you can do to stop living paycheck to paycheck. We have seen the trend of people having no emergency fund, spending every last dollar of their paycheck and even subsidizing the remainder of their expenses with credit. The problem is largely with incomes not keeping up with the rising cost of living, coupled with the consumerist attitude of our society – buy now, buy more, and spend money you don’t have. Pair that with easy access to credit and you have a recipe for disaster. If you have never had a delayed paycheck, for whatever reason, and have never panicked that you can’t pay your expenses, you may be living in a false sense of security. You may not think you are at risk, you may not think there is any problem, but there is. Many situations could arise to prevent your steady income – illness, accident, job loss, etc – and in the end, old age will eventually prevent you from continuing your job. Living paycheck to paycheck not only takes a toll on our finances, i.e. lack of saving for the future, but also on our psyche. The stress that accompanies this lifestyle is often intangible, but grossly impactful nevertheless. The feeling of a hamster on a wheel — working and working and not really getting ahead financially — is exhausting and depressing. We begin to feel helpless, envious, and overall dissatisfied with life, unable to appreciate the important things in life and take time out to enjoy them. Most people living paycheck to paycheck have debt. Whether the debt is a result of a low income to spending ratio, or a contributing factor to the inability to get ahead, is a chicken before the egg question. Debt allows us to buy now pay later, to have what we can’t afford in the present, and in turn prevents us from affording things in the future because of its inherent cost: interest. Debt makes things even less affordable. Think about the debt you have right now — what did you get for it? Clothes? A vacation? Electronics? A car? Do you find the price of the item coupled with the price of the debt, both financial and psychological, to be worth it now? It is crucial to analyze why you have debt and whether that debt is worth it to you, in order to make the changes required to get out and stay out of debt. Not many people want to work until the day they die, and not many people want to be in debt for the rest of their lives. That is our motivation to say no to new debt, to say no to consumerist temptations and living beyond our means. Living within our means is not living paycheck to paycheck without debt, it is being able to put money aside for the future. For future emergencies, future purchases, future luxuries and future retirement. Here is how to stop living paycheck to paycheck: cut back on unnecessary spending, find more income if you can, and create a debt repayment plan (read our how to guide for making a debt repayment plan, or work with a licensed credit counsellor at Women and Money Inc to develop your debt free plan). This entry was posted in Blog, Budgeting, Debt. Bookmark the permalink. Both comments and trackbacks are currently closed.